Overall Height (in): 9.875 in. Overall Width (in): 11.000 in. Overall Thickness (in): 0.750 in. Heat has always been the number-one cause of premature automatic transmission failure. TCI Max-Cool transmission coolers are the most effective way to keep your transmission cool and extend its durability and performance. 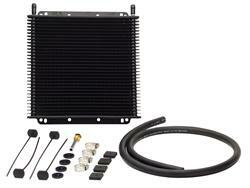 Available in multiple sizes, TCI Max-Cool transmission coolers utilize a special plate and fin design, which reduces transmission temperatures by 33 percent over tube-style transmission coolers.